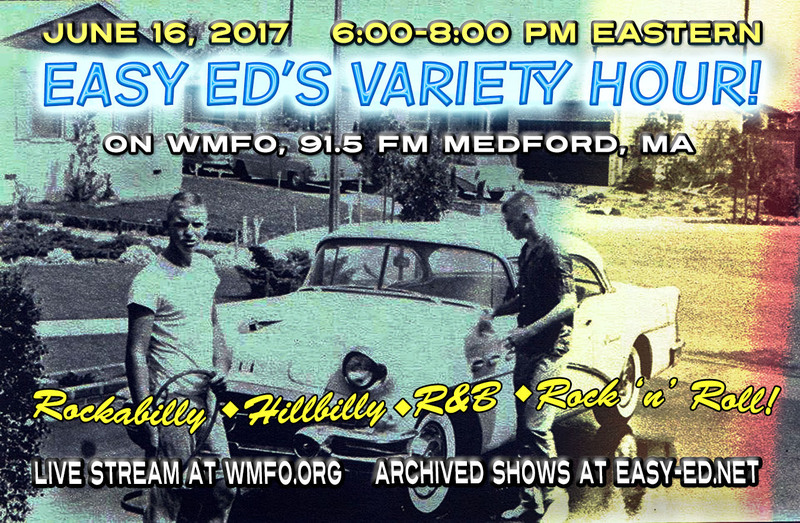 Catching Up: The June 16 Episode of Easy Ed's Variety Hour + Lots of News! It's been a while since my last post so I've got some catching up to do. First off, if you missed last night's broadcast you can download the always-free archive MP3 right here. In the same place you will find almost three years' worth of archived episodes. Hope you enjoy them! The song list from last night's show is at the bottom of this post. This show features brand new rockers by the Wheelgrinders from Vancouver, the Retrobaits from England, and Oklahoman T.J. Mayes; selections from two excellent recent collections on the Be Sharp Record label,The Florida Box and the Michigan Box; and songs by Deke Dickerson, Doug Sahm and the Pharoahs, Charlie Gracie, the Clovers, Big Mama Thornton, the Kaisers, and lots more. 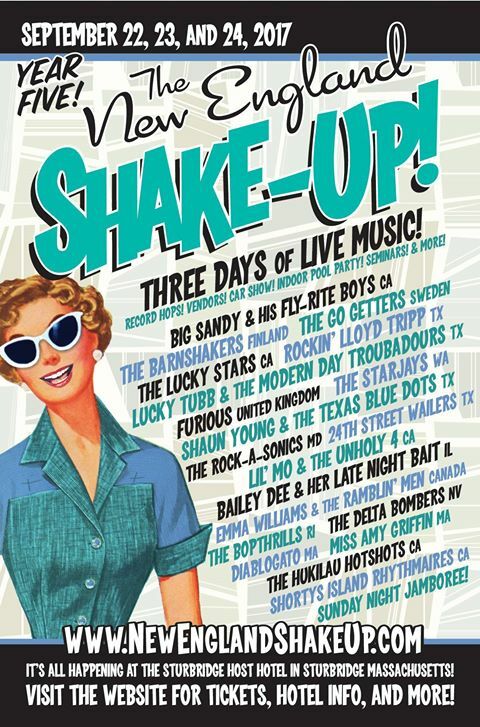 I'm a big fan of The England Shake-Up, an excellent rockabilly weekender that takes place every September in Sturbridge, MA. Year 5 is coming up, and the band list is incredible--check out that line up. 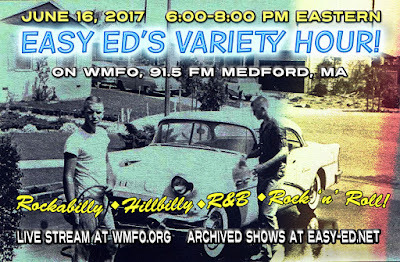 Easy Ed's Record Hop will be there spinning platters! See the link for hotel and ticket information. This is a super-fun event. I am arranging a November show in the Boston area for Deke Dickerson (with Jittery Jack and Miss Amy also on the bill). Stay tuned for details. And speaking of the Kaisers: They have an exciting 25th anniversary show coming up on June 24 (with the Embrooks opening). It's at the 100 club in London, so I don't think I'll be able to make it (sadly), but I hope to find a copy of their soon-to-be-issued reissue of "Wishing Street" on LP. 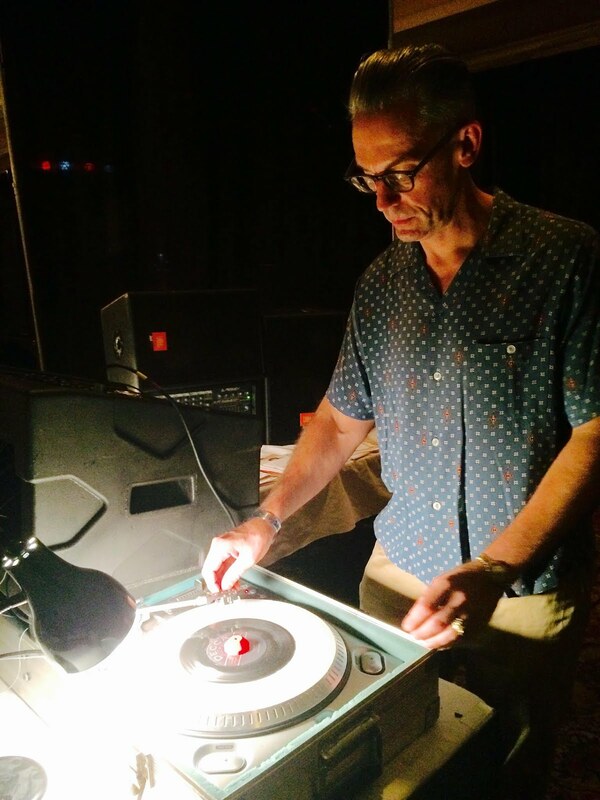 I've worn out my CD over the years, and it will be great to have the songs on record (although I would prefer a set of 45s to an LP--fingers crossed). The Kaisers put out lots of music in a short amount of time. It's all fantastic, must-have stuff. Worcester's Fearless Leaders have some Kaisers tunes in their repertoire, and lots more fast-past rock 'n' roll songs played just the way I like! 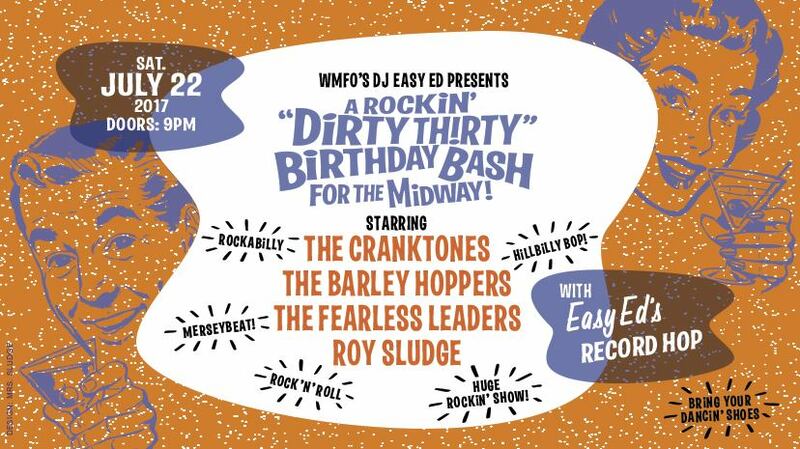 I'm excited to be hosting a show next month at the Midway with those guys, The Cranktones, The Barley Hoppers, and Roy Sludge (plus Easy Ed's Record Hop). This show is part of a two-week series celebrating the Midway's 30th anniversary. It takes a special kind of fortitude to keep a rock 'n' roll venue going for so long in Boston (especially in recent years, where greedy developers try to replace everything cool with a granite counter top). Cheers to the Midway! Happy Birthday, and rock on. 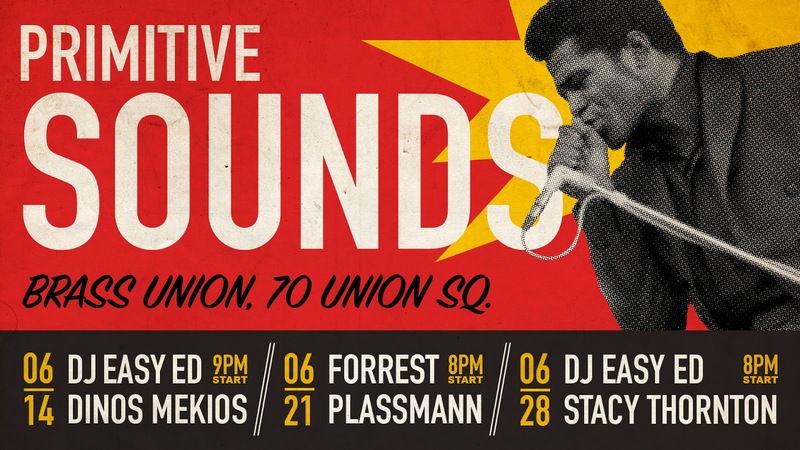 This Wednesday (June 16) I will be spinning a set or two with Forrest Plassman at Brass Union in Somerville, MA. 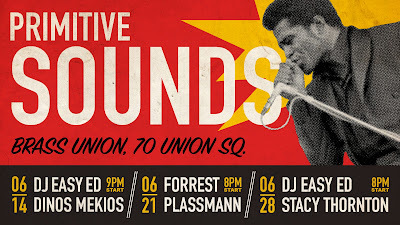 Since the abrupt closing of River Gods last July, Brass Union is the new home for Primitive Sounds, my rock 'n' roll/rockabilly/rhythm and blues DJ night--which is one of the longest running DJ nights in Boston (I'm proud to say!) We spin at Brass Union the second, third, and fourth Wednesday of each month. There's no cover and the food and drinks are top notch. Check us out! Thanks for listening (and reading). Have a great weekend, folks! The Retrobaits “Hey Mr. Bottle” from Preview from forthcoming release. The Starjays “My Wild Girl” from Bang! It's the Starjays on Rhythm Bomb Records — See them in Sept at the New England Shake-Up!